Bedford Falls, New York, U.S.
George Bailey is a fictional character and the protagonist in Frank Capra's 1946 film It's a Wonderful Life. The character is a building and loan banker who sacrifices his dreams in order to help his community, to the point where he feels life has passed him by. Eventually, due to a cruel business rival's manipulations, Bailey falls into despair so deep that he contemplates suicide, until his guardian angel, Clarence Odbody, gives him a valuable perspective on the worth of his life. The character was listed ninth on the American Film Institute's 2003 list of the 50 greatest screen heroes. 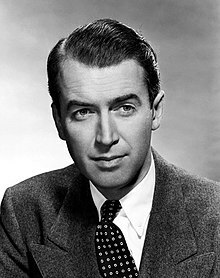 Bailey is played by James Stewart as an adult and Bobby Anderson as a child, and is loosely based on George Pratt, a character in Philip Van Doren Stern's 1943 booklet The Greatest Gift. In the winter of 1919, George (aged 12, portrayed by Bobby Anderson) and his friends Bert, Ernie Bishop, Marty Hatch, Sam Wainwright, and his brother Harry are sledding on a frozen river. Harry breaks through the ice and George jumps into the freezing water to save him. George develops an infection which deafens him in his left ear. In May 1920, George returns to his job at Mr. Gower's drug store, where he finds a telegram informing Gower that his son has died in the Spanish flu pandemic. A shaken Gower directs George to deliver medicine to a customer, but George realizes that in his distress Gower has inadvertently put poison into the capsules. He seeks advice from his father, who is president of the Bailey Brothers Building & Loan, but his father is meeting with miserly banker Henry F. Potter. When he returns to the store, Gower angrily upbraids him for not delivering the capsules until George blurts out the mistake. Gower suddenly understands, and is tearfully grateful; George promises he will keep the incident a secret: "I won't ever tell a soul. Hope to die, I won't." In June 1928, George (played by James Stewart) is preparing for an overseas trip. He drops by his brother Harry's graduation party at the high school, where he is re-introduced to his friend Marty's eighteen-year-old sister, Mary Hatch. While walking Mary home a car pulls up and George is informed that his father has had a stroke. Three months later, George is in a meeting with the board of directors of the Building & Loan to appoint a new successor to the late Peter Bailey. Potter argues that the Building & Loan should be dissolved. The directors tell George that the Building & Loan will only stay open if he agrees to remain and carry on his father's work. George foregoes a trip to Europe and his plans for college, giving the funds saved toward tuition to his younger brother. In 1932, George and Uncle Billy are waiting at the Bedford Falls railroad station for Harry to come home from college, when Harry arrives with his new wife, Ruth. Her father has offered Harry a job, which means he would not be taking George's place at the Building & Loan. Although Harry vows to turn the offer down for George's sake, George cannot bear to allow his brother to throw away such an opportunity, so he remains in Bedford Falls. While the family is celebrating Harry's return, Ma Bailey mentions to George that Mary Hatch is back from college and he should pay her a visit. He eventually goes to Mary's home to visit her, only to find that she is being courted by his friend, the now wealthy but absent, Sam Wainwright. A few months later, George and Mary are married. Their plans for a honeymoon in New York City and Bermuda are interrupted by a run on the banks which also affects the Building & Loan. Potter's bank calls their loan, and panicked depositors want their money, threatening to take their business to the bank. As a stockholder, Potter threatens to shut the Building & Loan if they are forced to close early. Mary and George use the money saved for their honeymoon to keep the Building & Loan solvent. In 1934, thanks to the Building & Loan, the Martini family move out of 'Potter's Field' to the new 'Bailey Park', a residential development created by George that proves successful enough to seriously threaten Mr. Potter's rental interests. Potter offers George a job. Although this would bring a significant increase in salary George declines. George returns home to learn that Mary is pregnant. Their first child is a son, whom they name Pete after George's late father. Their second child is a daughter, Janie. During the war years, George and Mary had another two children, a girl, Zuzu, born in 1940, and a son, Tommy, born in 1941. Due to George's deaf ear, he was given a 4-F draft classification and had to stay in Bedford Falls. His friend Bert the Cop went to Africa to fight, was wounded, and received the Silver Star. Ernie was a member of the airborne, and parachuted into France on D-Day. Marty helped capture the Bridge at Remagen, Sam made a lot of money making plastic hoods for planes, and Harry fought as a naval flyer and shot down fifteen planes, two of which were attacking a troop transport. For his bravery Harry Bailey was awarded the Medal of Honor by the U.S. president, Harry Truman. While all of this happened, George served as an Air Raid Warden. Despite having to look after four children, Mary still had time to run the United Service Organizations in the town, and Mr. Potter became head of the draft board. On Christmas Eve morning, Uncle Billy is on his way to the bank to deposit $8,000 of the Building & Loan's cash funds. Holding a newspaper which has Harry on the front page he greets Potter saying, "Well, good morning, Mr. Potter. What's the news?" Billy grabs Mr. Potter's newspaper and says, "Well, well, well, Harry Bailey wins Congressional Medal. That couldn't be one of the Bailey boys? You just can't keep those Baileys down, now, can you, Mr. Potter?" Potter angrily snatches the paper, but Billy inattentively allows the money to be snatched with it. After returning to his office, Potter opens the paper, notices the money and keeps it, knowing that displacement of bank money would result in bankruptcy for the Building & Loan and criminal charges for George. Billy goes back to the Building & Loan and tells George the news. George is extremely worried, especially with the bank examiner just outside the room. George and Billy go through the town taking every step Billy took in the morning and it goes to a dead end. George later goes home, and Mary knows straight away something is wrong with him. To add to his anger, he finds out his youngest daughter Zuzu has come home with a cold, George blames it on her teacher. When she calls he berates her on the phone, and her husband, as well. He then gets frustrated with his family and ends up smashing up the models of buildings and bridges he had made. A desperate George appeals to Potter for a loan. Potter sarcastically turns George down, and then swears out a warrant for his arrest for bank fraud. George, now completely depressed, gets drunk at the bar owned by his friend, Martini, where he silently prays for help. He also gets a full punch to the face from Zuzu's teacher's husband, who is drinking there. Again George runs out, and drives his car into a tree. He comes to a bridge intending to commit suicide, feeling he is "worth more dead than alive" because of a life insurance policy. Before he can leap, another man jumps in first and pretends to be drowning. After George rescues him, the man reveals himself to be George's guardian angel, Clarence Odbody. George does not believe him, and he bitterly wishes he had never been born. Inspired by this comment, Clarence shows George what the town would have been like without him, with the snow outside stopping as the change is made. In this alternative scenario Bedford Falls is instead named Pottersville, and is home to sleazy nightclubs, pawn shops, and amoral people. Bailey Park was never built, and remains an old cemetery. Mr. Gower was sent to prison for poisoning the child and is despised and homeless. Martini does not own the bars and is instead run by Nick, with a gruff personality throws George and Clarence out of the bar. George's friend Violet Bick is a taxi-dancer who gets arrested. Ernie is hopelessly poor, with his family having forsaken him. Uncle Billy has been in an insane asylum for many years since he lost his brother and the family business. Harry is dead as a result of George not being there to save him from drowning, and the servicemen he would have saved also died. (A deleted scene exists in which George finds Martini's grave near Harry's, as Martini and his family died in a fire because they couldn't move out of Potter's slums.) Ma Bailey is a bitter widow, and Mary a shy, single spinster librarian. George, Mary and their youngest daughter Zuzu. George runs back to the bridge and begs to be allowed to live again. His prayer is answered, shown as the snow restarts, and he runs home joyously, where the authorities are waiting to arrest him. Mary, Uncle Billy, and a flood of townspeople arrive with more than enough donations to save George and the Building & Loan. George's friend Sam Wainwright sends him a $25,000 line of credit by telegram. Harry also arrives to support his brother, and toasts George as "The richest man in town". In the pile of donated funds, George finds a copy of The Adventures of Tom Sawyer inscribed, "Dear George: Remember no man is a failure who has friends. P.S. Thanks for the wings! Love, Clarence." A bell on the Christmas tree rings, and his daughter Zuzu says, "Teacher says every time a bell rings, an angel gets his wings!" George agrees and looks up to heaven and says, "Attaboy, Clarence." George realizes that he truly has a wonderful life. Citing generosity as Bailey's most admirable trait, Time magazine lists George Bailey among their top ten movie dads. ^ "Phillip Stern Library". Archived from the original on 2013-12-24. Retrieved 2013-09-08. ^ a b c "Showtimes, reviews, trailers, news and more - MSN Movies". Retrieved 8 February 2017.